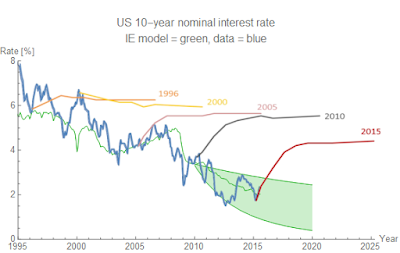 The decline [in long term interest rates] has come largely as a surprise. Financial markets and professional forecasters alike consistently failed to predict the secular shift, focusing too much on cyclical factors. The above graph and quote are from this blog post by Obstfeld and Tesar (H/T John Cochrane) from July of this year. I've been doing some time series forecasting using the information equilibrium (IE) model recently; how does the IE model compare to the Blue Chip Economic Indicators (BCEI)? 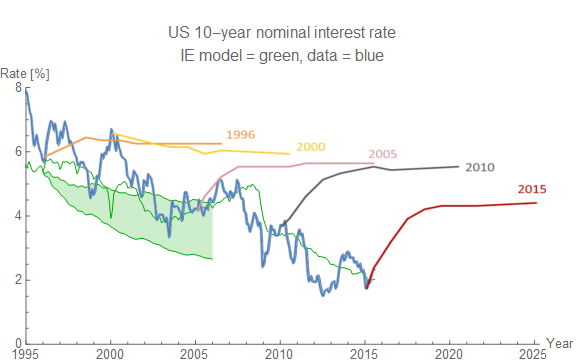 With the exception of 2005 (which is when the Fed embarked on its tightening before  the great recession) where the prediction is uncertain, the IE model does a much better job of forecasting 10-year nominal interest rates in the far future. The bands in the following are the 1-sigma errors (68% confidence limits). In this case, the IE model is a bit low in the near term, but better in the long term -- the opposite of the BCEI predictions. 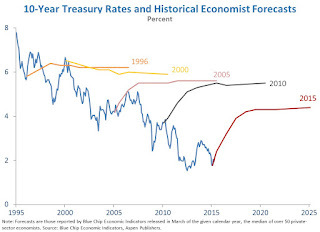 In this case, I used 1999 as the prediction year instead of 2000 because the spike in base money due to fears of the 1999/2000 transition throws the model off. Even this does better than the (March of) 2000 BCEI predictions. 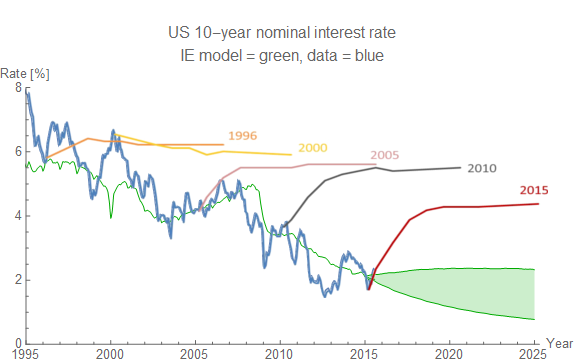 This is the aforementioned case where the IE model becomes uncertain of the path of future rates and the Fed guides the economy between the high (initially) and low end (after the crisis) of the prediction bands. 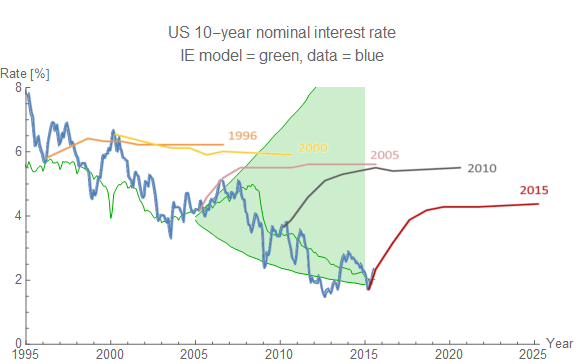 In this one, the IE model is spot on and far better than the BCEI prediction. We don't have the data yet, but I'd hazard a guess that the IE model predictions will be better than the BCEI predictions. 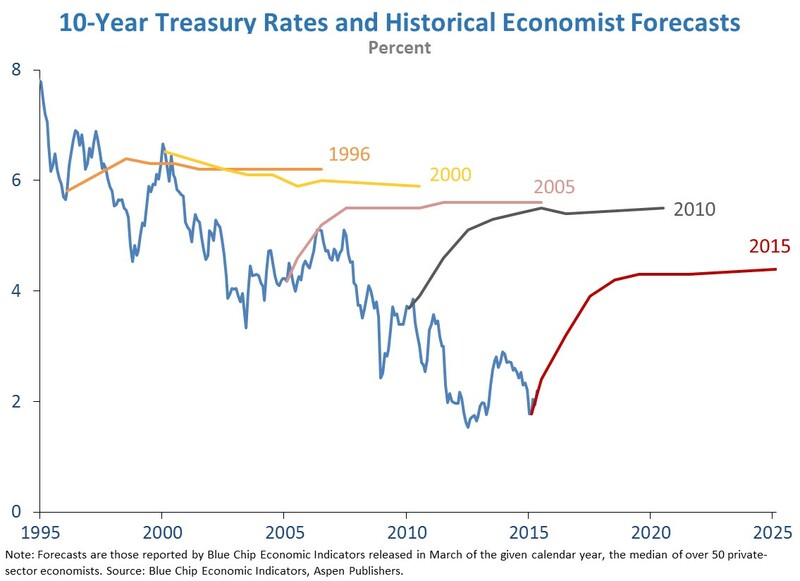 If the Fed goes through with its projected short term rate increase in September-ish time period, it could impact this projection, but only if the Fed unwinds a large fraction of the QE in the short term. Aggregate demand (N) is in information equilibrium with base money (M). The quantity information flow from aggregate demand to aggregate supply (mediated by money) is measured by the price of money (p). That price is in information equilibrium with the nominal interest rate (r). 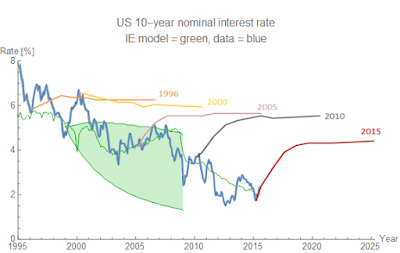 The model (green line) shown in all of the graphs above is actually the model fit using all of the data from 1960 to 2015. However, the projections only use the model fit to the data from 1960 to the projection year (1996, 1999, 2005, 2010, 2015). This is visible in some of the projections above as the start point of the projection is noticeably off of the green line (2005 is the most visible, 1999 is the second most visible). Using FRED series M = MBCURRCIR [converted from millions to billions of dollars], N = GDP and r = GS10. I wanted to put "precipitating" instead of "before" because of some other considerations of the IE model, but went with the more neutral version. Jason, what's different with your previous post here? What stands out to me is that in the old post the error bars (1-sigma?) seem to converge rather than diverge in some of the frames of the animation, and they don't start out at a point (they're separate the whole way), whereas here they all diverge from a point coinciding with the year the prediction is made. Why the different treatment in the two posts? One uses the nonlinear model fit single prediction errors (at the link) and the time series mean prediction. The graphs here use the time series model error which increases in uncertainty from the point of prediction. In a sense the linked post assumes the time series is a peefect prediction. The present post assumes the model fit is perfect. Do you have similar predictions for the UK? Some time ago you speculated that the UK might be the first to exit the Great Recession, so it would be interesting to see what the projected 10-year rate path looks like for the UK. I haven't run the model, but I will do so. Are higher interest rates inflationary?